Our Partners - New World - Bags Not - Say 'Bags Not' to single-use plastic bags. New World supermarkets are leading the way. They’re on track to be free of single-use plastic bags by the end of 2018. 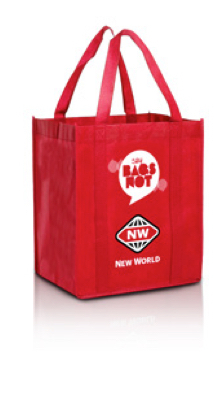 To help customers get used to the idea, New World is giving away millions of long-life reusable bags over the coming months. And they’re a proud supporter of “Bags Not”. New World is also at the forefront of soft plastics recycling in New Zealand – that’s plastic bags and plastic product wrapping. They’re responsible for returning over two thirds of the soft plastics that are currently being recycled through collection bins located at their supermarkets around the country. And that’s just for starters. New World is working on all sorts of other projects to reduce plastic packaging and plastic products in general to go with their amazing waste reduction and energy-efficiency projects. This includes the installation of electric car charging stations at stores up and down the country, plus donating millions of meals each year to community groups in need.